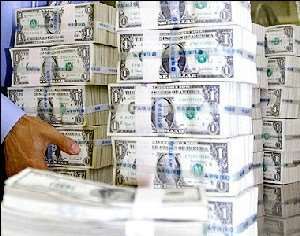 United Nations, January 26 -- The world economy grew by four per cent last year, but a rapidly falling US dollar poses a danger to economic stability worldwide, the United Nations has said. The UN department of Economic and Social Affairs (DESA) in a report on Tuesday said cyclical economic recovery reached a peak in 2004, especially for developing countries, and "the possibility of an abrupt and globally damaging correction persists, since the depreciation of the dollar alone seems unlikely to be sufficient to reduce the global imbalances to sustainable levels in an orderly fashion." "The global imbalance is between consumption and debt in the United States and ballooning surpluses in many US trading partners. Currency changes by themselves, especially bilateral currency manipulation, will not resolve the problem," it adds. Gross world product increased by four per cent in 2004 and could rise by 3.25 per cent this year, unless there is a negative market reaction to the falling dollar and rising US deficit, it said. Meanwhile, the 'oil shock' of a 50 per cent price rise in the first six months of 2004 was based on a demand surge, not the inadequate output of previous shocks "and therefore is more amenable to smooth market adjustment," it says. Oil prices would be higher than average but lower than last year's peak, UN under-secretary-general for economic and social affairs Josi Antonio Ocampo told reporters at United Nation on the report's launch. Balances in the oil market had changed because the war in Iraq had generated a 'fear premium' that had rippled throughout the Middle-East region, but oil prices had not had a negative effect on the world economy overall. Nonetheless, "greater global economic cooperation would be needed to avoid a hard landing," with challenges ahead for many countries and their central banks, Mr Ocampo said. The US and Chinese economies are the main engines of global economic growth, with the United States stimulating manufacturing and China buying raw materials from resource-rich developing countries and pushing up their average growth by 5.5 per cent, the strongest in two decades, it says. Only six African countries grew by the 7 per cent they need to reach the millennium development goals (MDGs) of halving extreme poverty by 2015, it says.